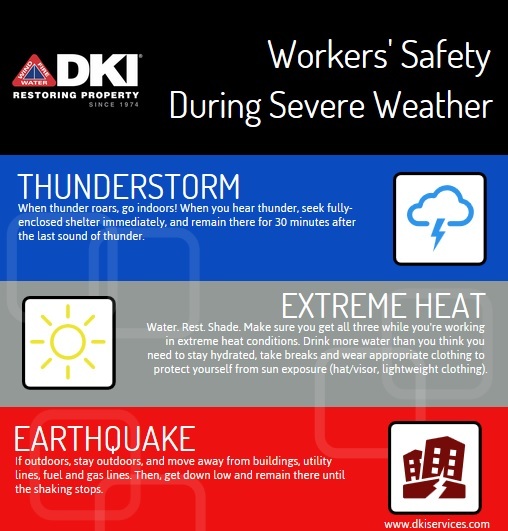 Whether you’re suffering from extreme heat or dodging thunderstorms, it’s important to keep you and your employees safe! Since the weather can sometimes be unpredictable, be prepared for all conditions so you don’t have to think twice when working outdoors during severe weather. First, and you’ve heard it before, but always do your research; identify potential weather disasters in your area. And, as you receive warnings for possible severe weather, continue to follow and listen to alerts from the officials so you are well prepared. If you hear thunder, go inside! Lightning is a dangerous force that can severely injure those working outdoors. According to the Occupational Safety and Health Administration (OSHA), over 300 people are struck by lightning each year in the United States. The National Oceanic and Atmospheric Administration (NOAA) advises that nowhere outside is safe from lightning strikes. Prior to working outside, check the weather report. If a thunderstorm is approaching, do not start or continue a task that cannot be quickly stopped. Include a list of nearby fully-enclosed buildings that your employees can remain in for at least 30 minutes after hearing the last sound of thunder. If a building is not available, they must seek out a hard-topped metal vehicle with rolled up windows that can be used as shelter until at least 30 minutes after the thunder stops. Do not shelter in sheds, tents, or other places that do not provide sufficient protection. Identify how long it will take your workers to reach safety wherever they may be working, and indicate these times, so they are prepared ahead of time. Include a list of projects and areas to avoid. Stay away from any place that may make you a tall object to target (open space, tall trees, hilltops, utility poles, cranes, ladders, large equipment, rooftops, scaffolding), and anything that can conduct electricity (wiring, fencing, plumbing, any bodies of water). Workers who are exposed to hot and humid conditions outside are at risk of heat-related illness. Most common workers affected include those performing strenuous activity, wearing heavy or non-breathable clothing, those new to an outdoor job. Remind your employees to do the following if extreme heat is in your forecast. Drink water throughout the day, and more than you normally would. Wear and reapply sunscreen regularly. Schedule work for earlier or later in the day to avoid the hottest parts of the day. If you don’t have a required uniform, wear a hat and loose, lightweight, light-colored clothing. Take frequent breaks in shady areas. Earthquakes can strike suddenly without warning, and all 50 states are at risk. It’s important to train your employees about safety during an earthquake – what they should do before, during, and after. If you are outside, stay outside. Avoid buildings, windows, utility wires, streetlights, fuel and gas lines; anything that can potentially collapse on you. Once in the open, “stop, drop and hold on.” Get down low, and remain there until after the shaking stops. After the earthquake, look around and go to an open space away from damaged areas. If you are driving, stop as quickly and safely as possible and stay in your vehicle. Avoid buildings, trees, overpasses, and utility wires. Once the shaking stops, proceed cautiously and avoid damaged roads.